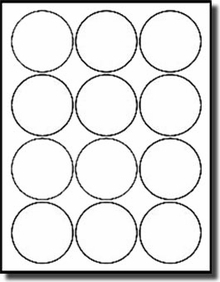 100 sheets of CLEAR Matte Surface Circular or Round LASER Labels. Size is 2.5" (2-1/2" in diameter, Same size as Avery® 5294. These labels are for use in laser printers only. 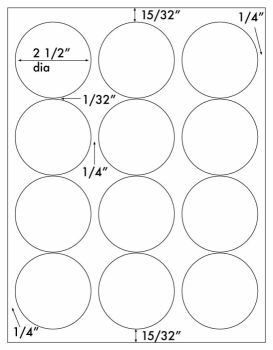 There are 12 labels per 8-1/2" x 11" sheet, for a total of 1,200 labels per package. Standard labeling and word processing programs have a template for this format. The Matte Surface clear stock almost disappears when printed, and applied to a piece of paper or a package. AVERY labels are manufactured by Avery Dennison. Avery is a registered trademark of that company. Label Outfitters® does not make Avery products. Avery Dennison product code numbers are protected trademarks of Avery Dennison.